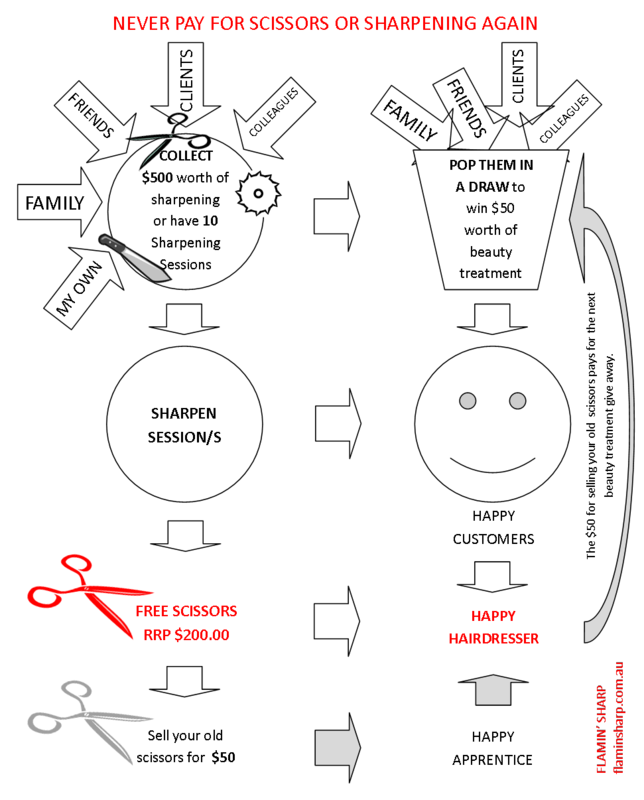 Please consider the following scenario: A very innovative Flamin’ Sharp hairdressing client takes full advantage of our ‘Loyalty Rewards’ Programme to make paying for sharpening and purchasing new scissors a thing of the past. ‘Loyalty Rewards’ allows for a 10% square to be marked off for every $50 worth of sharpening work we receive. This can be Scissors, Knives or Gardening Tools. They can be yours, family, friends or clients.Click here for more information about our rewards programme. During the course of her working day, she mentions to her clients that her sharpening professional is coming to town and if they are interested, Flamin’ Sharp will do their ‘Mates Rates’ special of 8 items for $50.00. They are encouraged to enter a draw for a free $50.00 in house beauty treatment by placing their name and details on a list. A few days prior to our arrival, she sends out an email or SMS reminding clients to bring in their items to be sharpened with a $50 note attached. Invariably on my 6 monthly visit, there is 10 bundles of gear that need our services which then entitles her to choose 1 scissor absolutely free from our ‘Salon Select' range. Since perfecting this strategy, her collection of scissors has grown to such an extent that she sells her second hand scissors to her apprentices for $50 and with a $50 sharpen, the apprentices have a top quality scissor for $100 that will do them for a few years. The $50 that she received for the second hand scissor then offsets the $50 in house draw for the free beauty treatment. This strategic alliance and marketing strategy is a win, win, win situation for all involved. The Hairdresser wins because with very little effort on her behalf, the cost of sharpening or indeed buying scissors has been reduced to virtually zero. Flamin' Sharp wins because we have just completed $500 worth or work in 1 location without having to chase it all over town. The client wins because they now have sharp Knives and Garden tools done at ‘mates rates' and have a 1 in 10 chance of winning a free $50 beauty treatment. The apprentice wins because they now have a decent set of scissors for a fraction of new price. As I always say to our licensees.